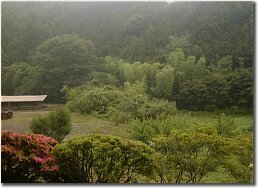 Shizuoka is a beautiful prefecture with its majestic Izu peninsula, green tea fields as far as the eye can see, and of course Mt.Fuji always looming in the distance. 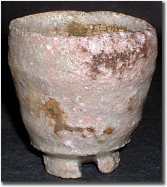 What is does not have, however, is a very ancient potting tradition. 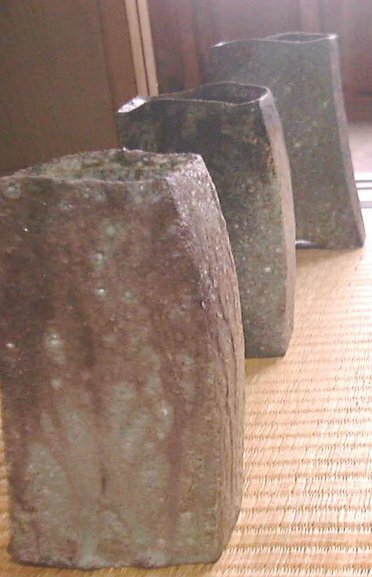 There were some old styles that are now basically lost, such as Shidoro-yaki, but nothing to be as proud of as its natural beauty. 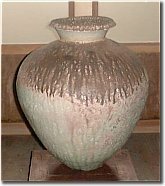 Yet, there are hundreds of potters in Shizuoka prefecture working in various styles that were transplanted from better-known potting centers. 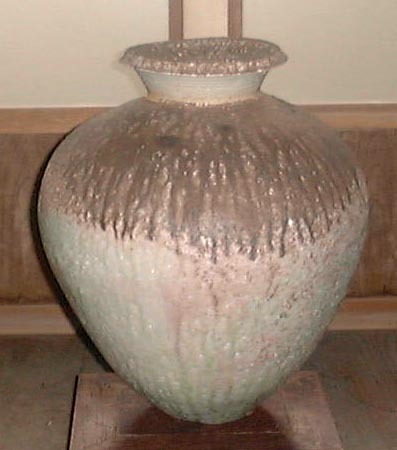 There are Karatsu, Iga, Shino, and Oribe potters among other styles all working in the "Land of Green Tea." 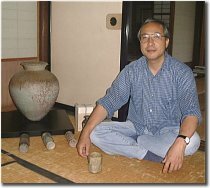 One such potter is Yoshisuji Keiji (1952 - ) who lives in a glorious setting in Mori-machi, in western Shizuoka prefecture. 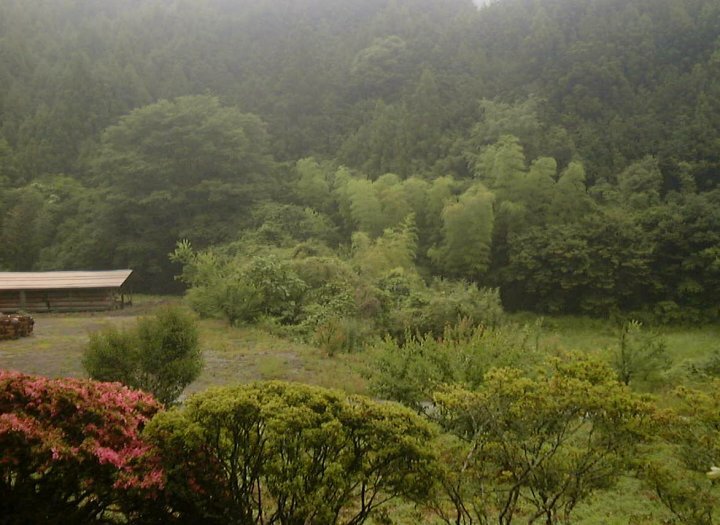 Please see photo of Yoshisuji above. 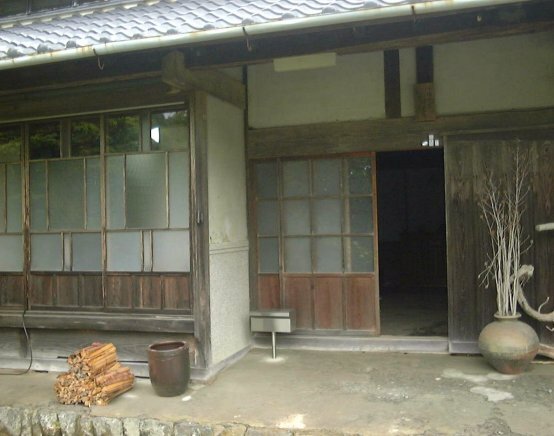 His home is a very traditional farmer's house built about 150 years ago and is surrounded by rolling hills and bamboo groves. I didn't want to be around long enough to start to imitate my teachers, so I moved on after learning what I needed.  If one stays too long his work becomes copies of the teachers. 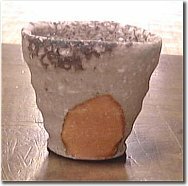 Look at Koie Ryoji's apprentices or Fujimoto Yoshimichi's students; all of these potters work is instantly recognizable as being a copy of the master's. I didn't want that. 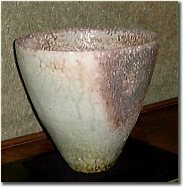 Yoshisuji fires yakishime (high-fired unglazed stoneware) using Shigaraki clay in a traditional anagama, but what is not so traditional is that he often fires the same works up to five, or six times! 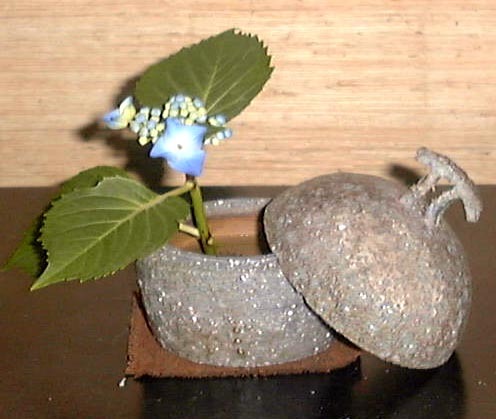 "Why should I have my work looking just like Shigaraki wares?" 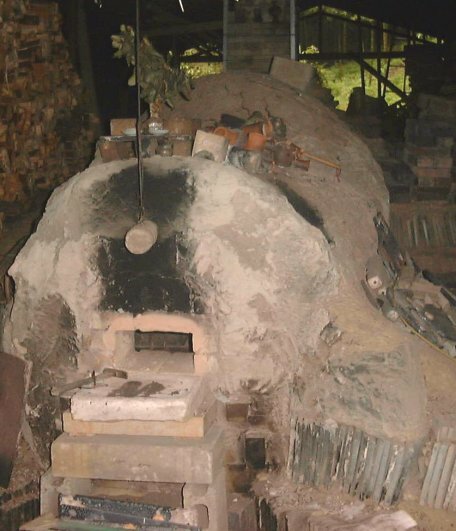 he asked as we drove to his kiln. 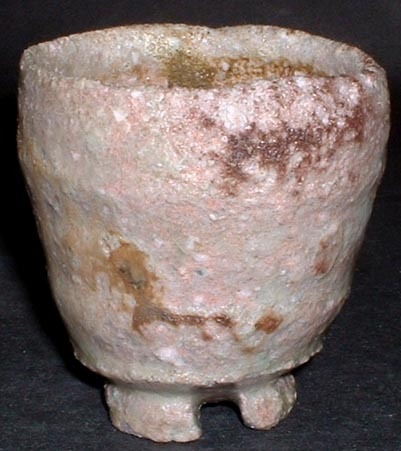 "I want to create pottery that has not been seen before in terms of firing. That's why I fire my works so many times. I want to push the works to the limit in terms of their ash coloration," he continued as he kept one eye on the road and one on me. 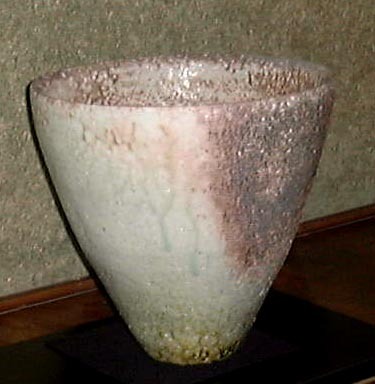 He does achieve some stunning effects on his works with their purple, blue, green, brown and black ash build-up that completely takes over much of his work. 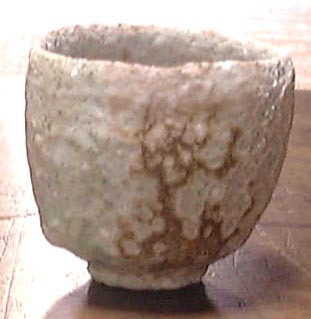 So much in fact, that it's often impossible to see any traces of clay. On this guinomi (see below photo), a light-green ash color melts and blends over the purples creating an intriguing landscape. 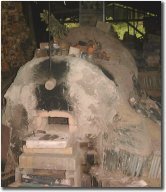 It is nothing any potter could calculate in the kiln; it is truly a gift from the kiln. 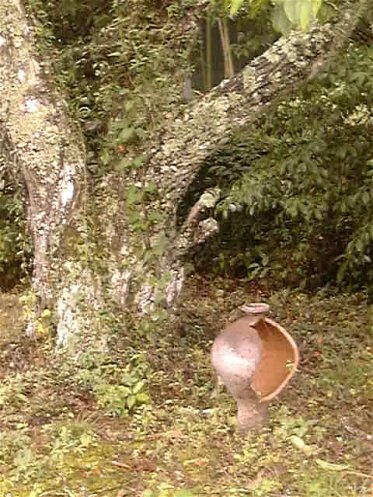 The ash is so thickly fused on that it's as if some works transformed themselves from clay pots into kaleidoscopic ash pots. 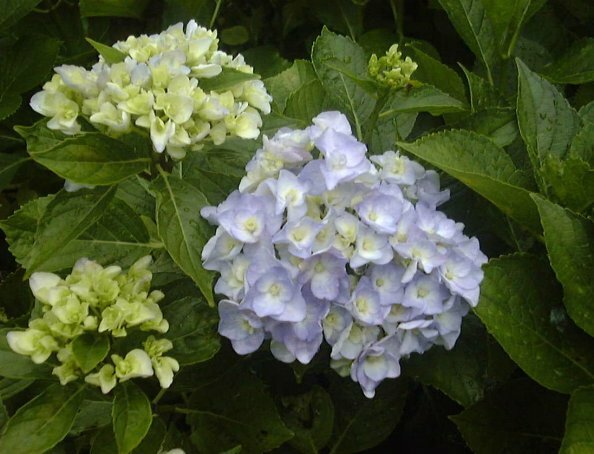 At times the effects are striking, as can be seen on the above guinomi. 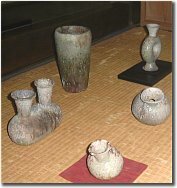 Most of the works are for flowers, sake, or Tea, as his crusty creations would not serve up food well. For his exhibitions to have only works that looked as if they came from the bottom of the sea or flew in from space would make an exhibition room too dark. 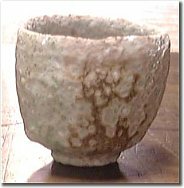 In order to avoid that, Yoshisuji does exhibit works that have been fired only once, or twice, and which do exhibit the often appreciated "tsuchi aji" (clay flavor) of yakishime. 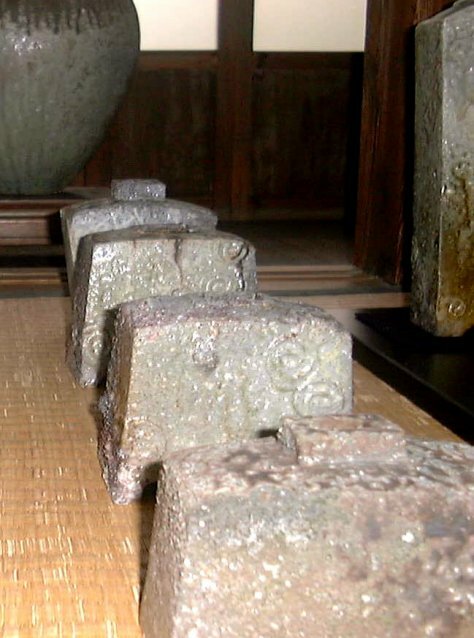 On his boxes though he doesn't sign the works "Shigaraki" or such, just "Shizen-yu Yohen." 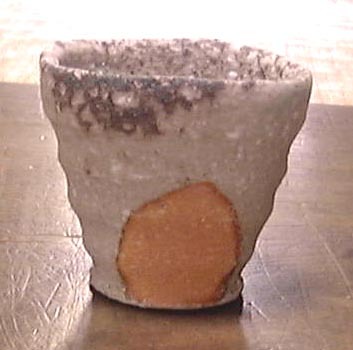 Shizen-yu means natural ash glaze, while Yohen means kiln mutation (literally means "changed by the fire/flame"). 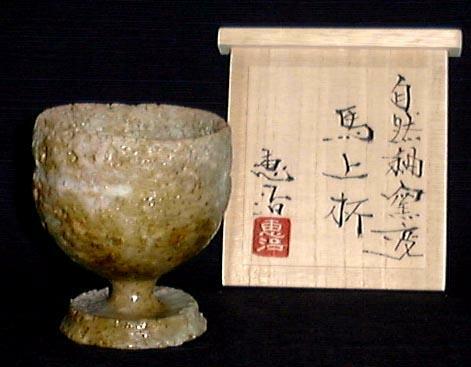 An example of his calligraphy can be seen here. 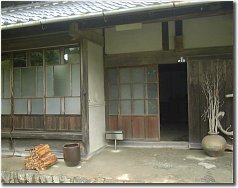 Below are some photos of other works and views outside his home. 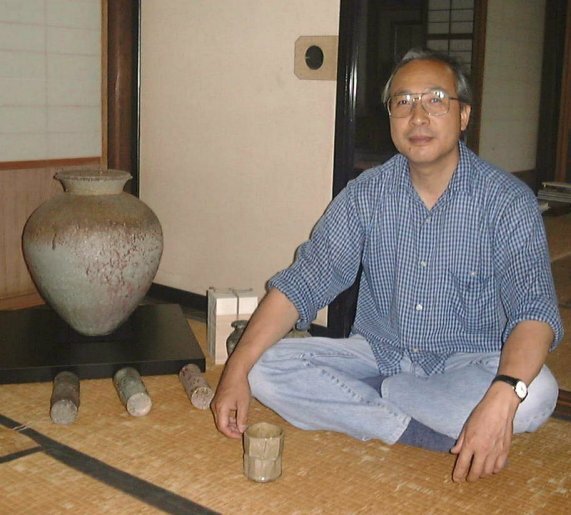 If you happen to be in Shizuoka for World Cup soccer this month, then you can also see Yoshisuji's exhibition from June 20 to June 26 at the Matsuzakaya Department Store, which is located in front of Shizuoka station. Many of the works pictured above are destined for this special exhibition commemorating the twentieth anniversary since the opening of his kiln. 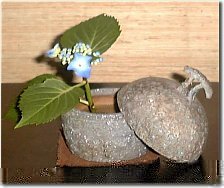 He is a potter who's just finding his stride and I look forward to more spectacular works born from the multi-firings and the spirit of Yoshisuji himself.